Why a GSP? 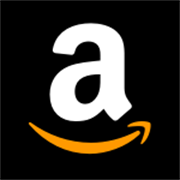 …Brian and I bought our dream home in April of 2009. A log cabin on a lake… only it didn’t quite “look” like a log cabin – – and, it wasn’t quite in “dream-home” state when we bought it (see Cello’s Cabin page). Our goal is to restore this historic log cabin to its original state, and to fill it with decorations and mementos of the great town we live in, as well as items that would be relevant to the cabin and it’s history. Brian works in the mortgage industry, and was able to research back to the original deed of our home. Brian was able to find out that the log home was built in 1927, and also discovered the name of the original owner. Out of curiosity, Brian Google-searched the man’s name. Low and behold, he came up in the search! The search result that came up was linked to the English Setters Club, a local and nationally known club that conducts field trials that are open to all pointing breeds. The original owner of our home owned a German Shorthaired Pointer, named “Windy Spot,” who won many awards at the club for field trials. I called the club to see if I could get more information on this dog and his owner, or a picture of them that we could hang in our cabin. When the man from the club called me back, and I explained my story, the other end of the phone was silent. When I asked if he was “still there,” he asked me to repeat where I lived – what street – what house, etc… come to find out, this man I was speaking to was a direct family member of the man who built our log cabin back in 1927!! Needless to say, it was quite an interesting conversation! 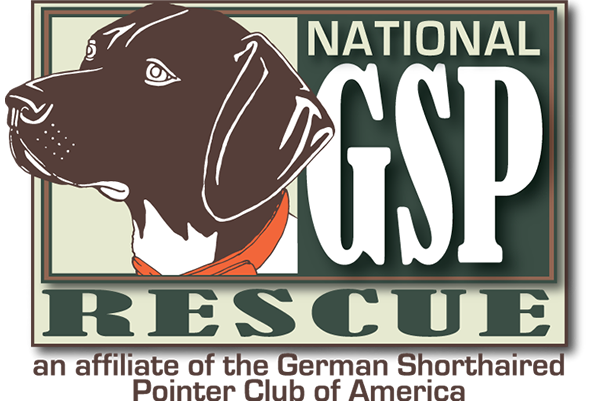 Brian and I immediately researched German Shorthaired Pointers online, and fell in love with the GSP breed, and all their characteristics. 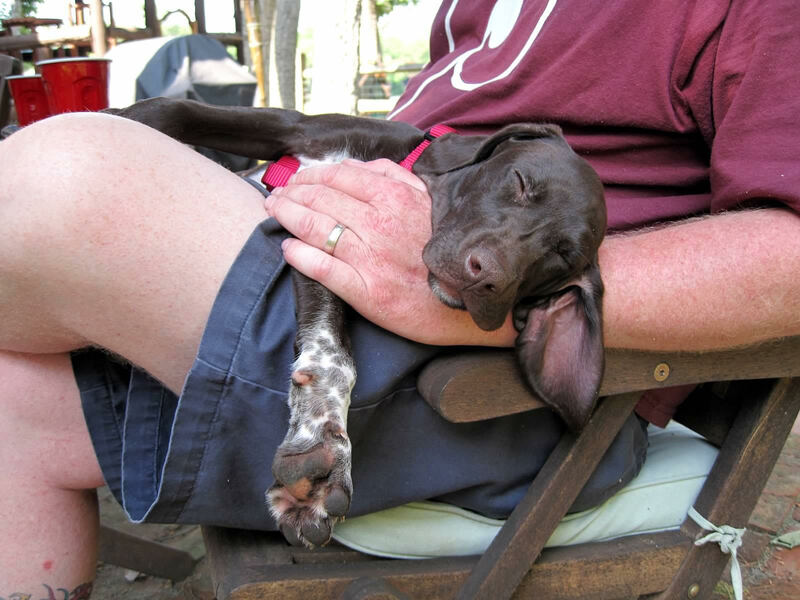 We knew a GSP would be the perfect addition to our lifestyle, our family, and our log home. We have named our log cabin “Windy Spot,” after the first dog that ever lived in our home! 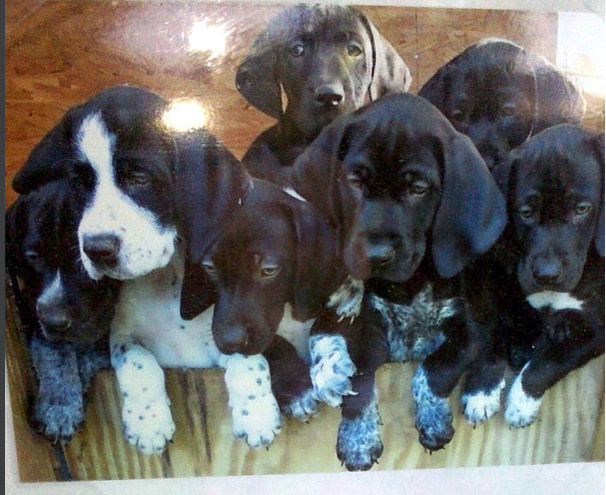 Brian and I were visiting a family member in West Creek, NJ on Memorial day weekend 2011, when they mentioned that they saw a post at at the local hardware store that there was a litter of German Shorthaired Pointers available not far from us. This litter was born on March 14, 2011, on a South Jersey farm in the town of Chatsworth. 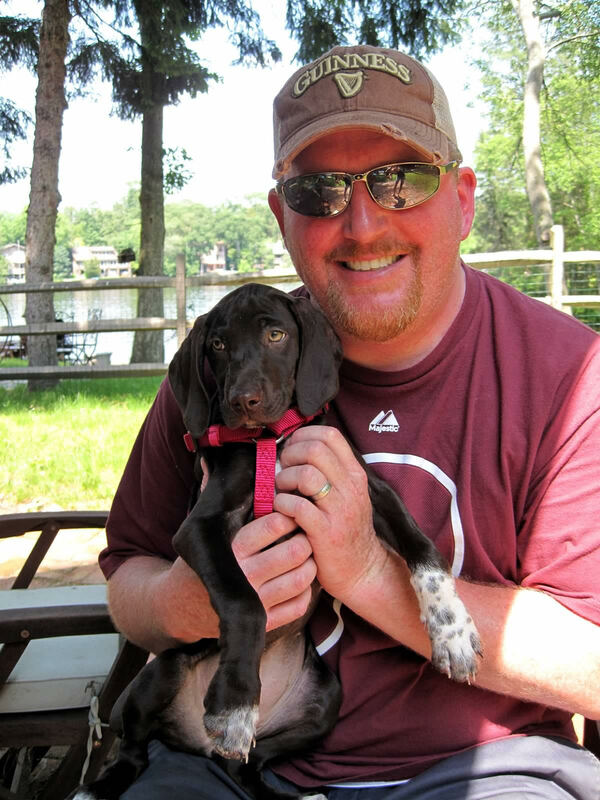 Brian and I became lucky parents of Cello on Monday, May 31, 2011 (Memorial Day), when decided to stop to talk to the man about his litter and knowledge of German Shorthaired Pointers. When we pulled up to the property, the owner opened up the barn doors, and out came 3 of the most adorable GSP puppies! One of them jumped right into Brian’s arms – we knew immediately she was coming home with us! Can you pick out Cello in this pic?! Cello is the ultimate water dog! If there is water in site, Cello must find her way into it…! Her entire body shivers with excitement with the site of water to jump into or lay in! Luckily we live on a lake, so she gets plenty of swimming and dock-diving time! We also keep a baby pool in the yard for her to lay in when she is not in “lake-mode.” She is also obsessed with soccer balls!! She has an outstanding personality, bringing smiles to people’s faces everywhere we go! Why “Cello”? 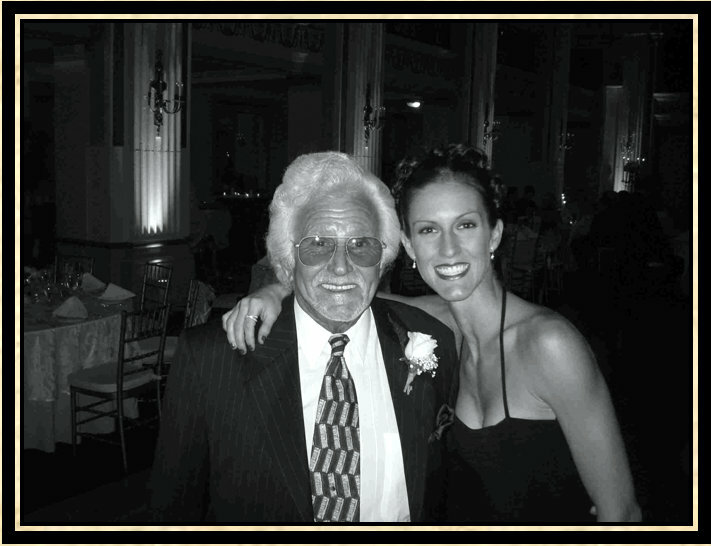 (pronounced CHELLO) …Cello’s full name is “Tommy D’s Limoncello.” Tommy D was my Italian grandfather (my mother’s father), who passed away in 2007. 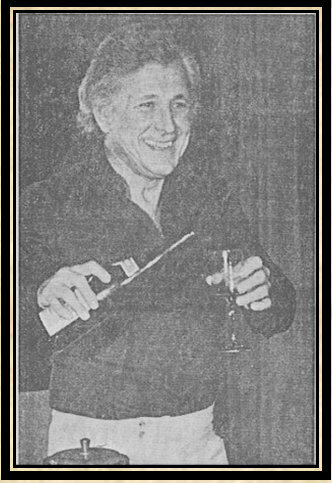 He was quite the character to say the least, and was “famous” among his family and friends for his homemade Limoncello, with his “secret” recipe. Before he passed, “Pop Pop Tommy,” revealed his “secret” recipe. Brian, as well as other family members, have been carrying on the tradition of making homemade Limoncello ever since. Read all about Tommy D’s Limoncello HERE!